April 07, 2011 by Alphageek in "alphageek", "discovery"
4/26/2011 Update This is it! The update you have been waiting for! 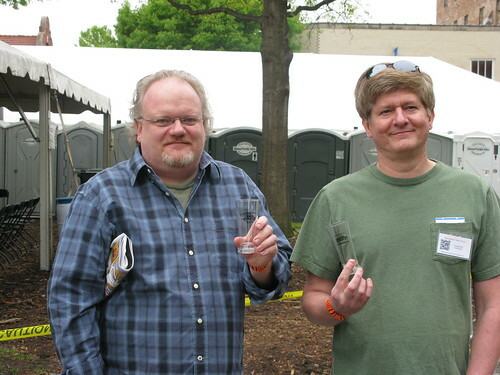 This is the final write up on the 2011 Raleigh Beer Festival! First things first: we would love to have your pictures added to our public set over on flickr, by clicking the link and going right to the page. If you don't have an account, flickr is free for a few hundred pictures and is a great site to look at as well as share pictures. We got things off to an early start. The weather was great, a little overcast, which helps keep the temperatures down a considerable amount. Thanks to the host Rob, we knew which line to get into to get timely entry into the event. Once there, we decided to get things off with a celebratory picture. Rob even wore a name tag for the website, so we want to say "thanks" right off the bat. Rob and Jeff posed for this great picture, before the tents were opened up for the festivities. We will be coming back here, so make sure to take a good look around. Any Beer Festival is a wonderful experience. One can walk around and sample large numbers of new, exciting (and some not so exciting) beers in a fun, adult, laid back atmosphere. As a matter of fact, the selection is so large that a methodology is called for. Come on, Alphageek is in the title of the site, you didn't see an algorithm coming? During the ride to Raleigh, Mrs. Alphageek helped me select what products would seem more desirable to sample. While this process did reduce the number considerably, the process still left many more to be sampled than was going to be possible. "The list" did make it possible to run up to some of the less full vendors and try some of their products. Do not think the Alphageek is the only one who shows up with a plan. Pictured below is someone I ran into while walking from booth to booth. 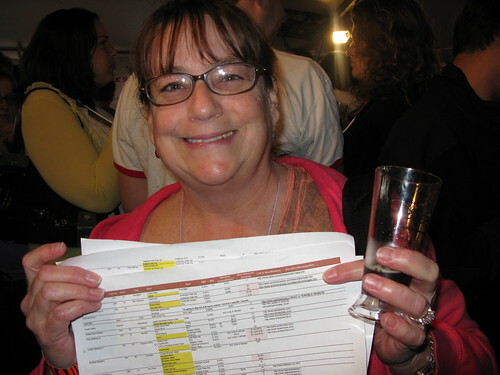 She has a spreadsheet of the vendors, marked up with all of the beer she wanted to try. She told me her daughter was a doctor, and something of a geek. I told her I was a geek too, and gave her a card. She graciously posed for the picture with her spreadsheet. Although you can get many varieties of beer here, there is more to see at the festival than just the beer vendors. One of the first interesting vendors we can across was Lusty Monks Mustard. We don't do endorsements here, but the Alphageek has a thing for mustard, and this stuff is pretty good. We might even do a feature on mustard here sometime. The Alphageek was remiss, because I was supposed to go buy some before we left, but I forgot to go. No problem, we will order some from their web site and let you know. The sample we had was outstanding, with that good, fresh ground taste that one hopes for in any mustard. There was something else that I am seeing more and more of these days, microbrews in cans. 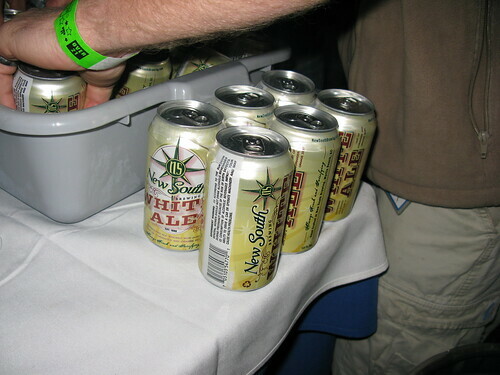 The picture below is of New South White Ale. I am not sure how I feel about this trend, but I think it is something we will see more of as the good folks that produce beer try to hold down costs. I was thinking of holding the next picture for my other website, Alphageek's Thoughts (all my bourbon thoughts) but I decided against it. 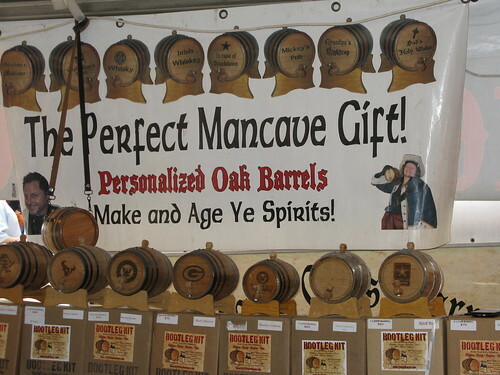 You can even find products to make your own spirits, at least that is what the sign says. I good a quick look around, but did not get a lot of information. I did take a picture for you, which I have below. I would recommend checking out their web site and letting me know if you decide to make a purchase. I think you age something in their barrels, rather than truly distill your own spirits. After all, you need a still to make real spirits and I did not see a still there. We continued to wander around, enjoying samples that are a part of a festival like this. We eventually wandered over to the Boone Brewing Company booth, and I struck up a conversation with one of the folks pouring beer. He seemed pleased to be talking to Virginia's Number One ranked food blog, which is something that made the Alphageek happy. I promised a picture, so he proudly showed off his logo, after taking a card. So, we were walking around, having a good time, when it became evident that nature was calling. After all, we were outside enjoying several samples and sooner or later we have to find the portapotties. We found them, and it was a good thing we did not wait. Remember the picture that I told you to memorize (its okay, just scroll back, look again, and come back, I won't know the difference.)? Now, these are some long bathroom lines. I think we all go to make some friends while we waited in line. I have never seen porta potties as a couples activity, until I was in this line. 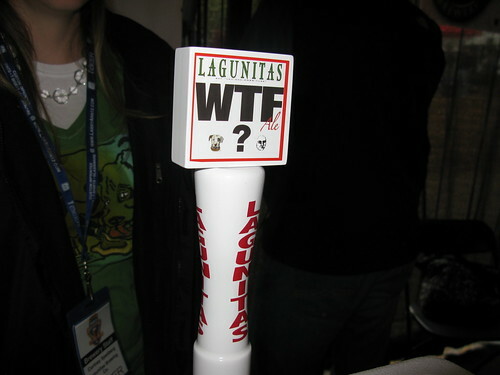 After that line, we all decided that the beer tap below summed up the lines nicely. After nature's call had been answered, the team became more discriminating, and we wandered around, sampling some of the wares here and there, at a much slower pace. Nobody wanted to get back in that line again. With the slower pace, we did take a few minutes to get some better pictures. Rob told the two ladies below that he knew the Alphageek, and they wanted to pose for a picture with him. 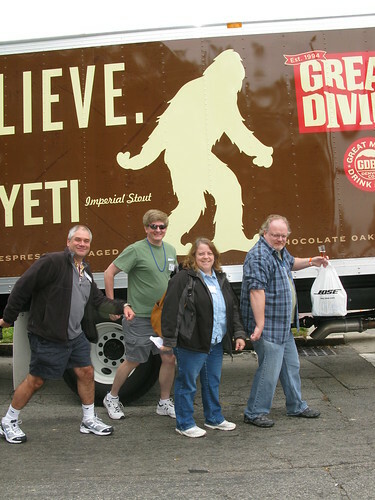 We then decided it would be funny to pose next to the Yeti Imperial Stout truck. While the guys were getting into it, Mrs. Alphageek felt that this was another stupid Alphageek idea, and decided just to smile for the camera. 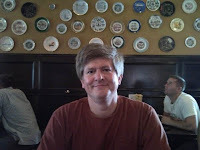 Finally, the Alphageek needed his own photo to close the post with. 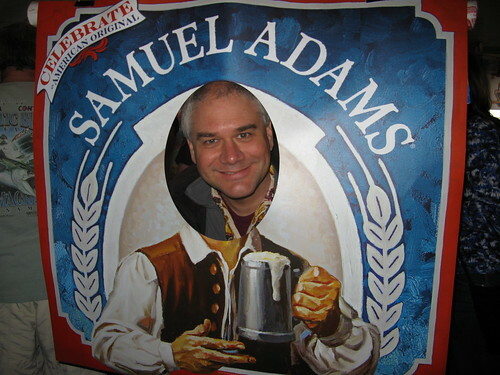 We stopped by the Sam Adams booth and tried out for the new label guy for the beer. I think one of the people in the photo with Rob got the job. We then decided to head out. Well, guys came around and yelled for everyone to leave. It was a great time for all. I hope you enjoyed a little different view of a beer festival. Sure, I could have written pages about the beers, but there are plenty of people out there doing that. I wanted to give you an idea of what you do at a beer festival, besides the obvious. We had a great time, and it is starting to look like I am going to make this an annual trip to Raleigh, if everyone is willing. 4/13/2011 Update The Festival has come and gone. The Alphageek would be remiss if he did not thank Liz and Barb for their extreme hospitality. 4/4/2011 Update! The folks at All About Beer Magazine have posted the program. You can download the program by clicking on this link. Take some pictures, and post them to the flickr page we have set up. We are looking forward to the large variety of samples that will be available and to taking some pictures for the web site! 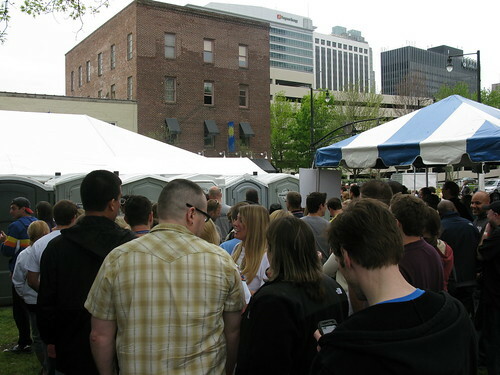 In a recent post we announced that we would be attending the 2011 Raleigh Beer Festival. We are now excited to announce that we have brought on board a host for the event. Pictured at left is our host for the event, Rob. 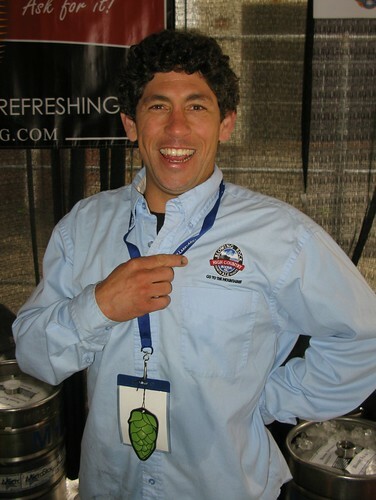 Rob brings an extensive beer knowledge to our team. He has over 30 years of beer drinking experience. He is the holder of three plates at the Flying Saucer. Each plate requires documented evidence of the sampling of 100 200 beers. He also has extensive knowledge of the local beer culture. We will use this knowledge to bring you reviews of some of the limited releases that are featured at the Raleigh Beer Festival. A particular favorite from last year was the featured Dragon's Milk. If you have a suggestions for something we should sample at the Raleigh Beer Festival, please leave some feedback below.